We are walking down a dark passage, holding on tight to each other’s hand, trying hard not to stumble over the uneven surface. It would be scary, straight out of a nightmare, if we had been alone. However, we are not. There are about a dozen more people with us, some like us, not uttering a word, some talking a bit too loud... maybe to boost their confidence. The sound reverberates around the passage, and it simply enhances the feeling of being trapped! And then the guide flashes his torch and the moment is lost. A bat flies from its perch.... we look up, and the ceiling is filled with bats! I now wish we had been left in the dark, unaware of the presence of these creatures! As the passage curves yet again and the guide disappears from view, there is a sudden rush to catch up with him..... The passage still fulfils the purpose it was built for, all those centuries ago – to scare and confuse the enemy caught within its walls. 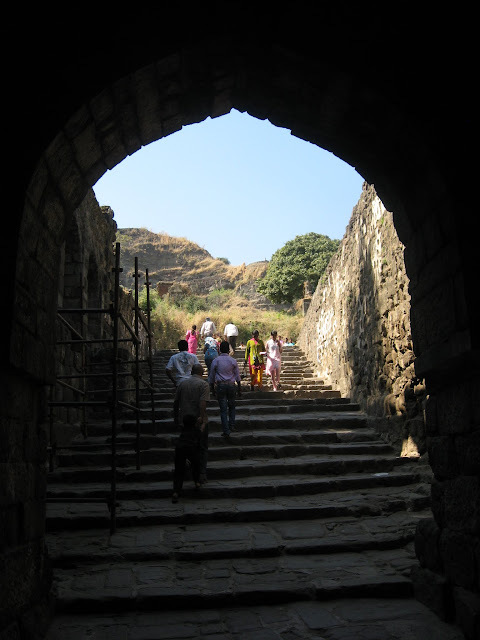 We are at the Daulatabad fort, in the passage known as the Andheri – literally, the dark passage. 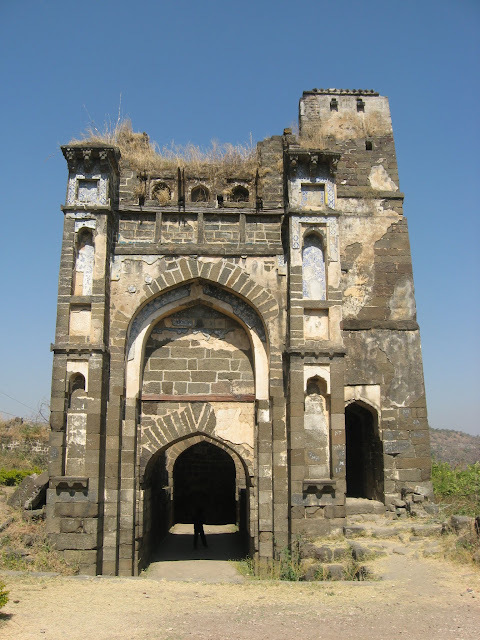 The Daulatabad fort was one of the most powerful forts in India during the medieval period. 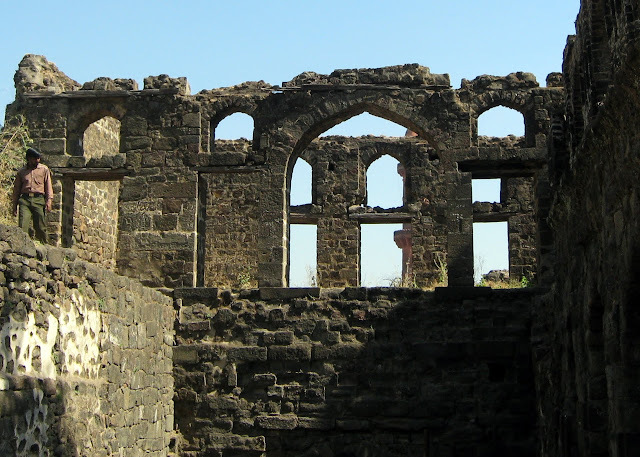 At one time, it was considered impregnable, on account of the complex and intricate defence systems it had in place, of which the Andheri was just one. 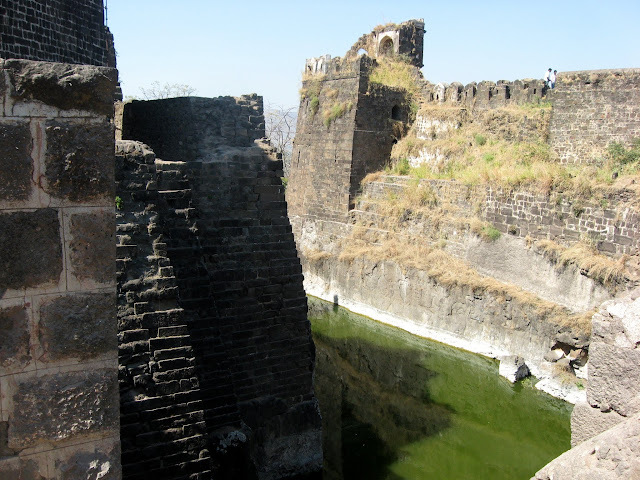 The fort is located atop a conical shaped mountain and is defended by a deep moat running all around the foothills. 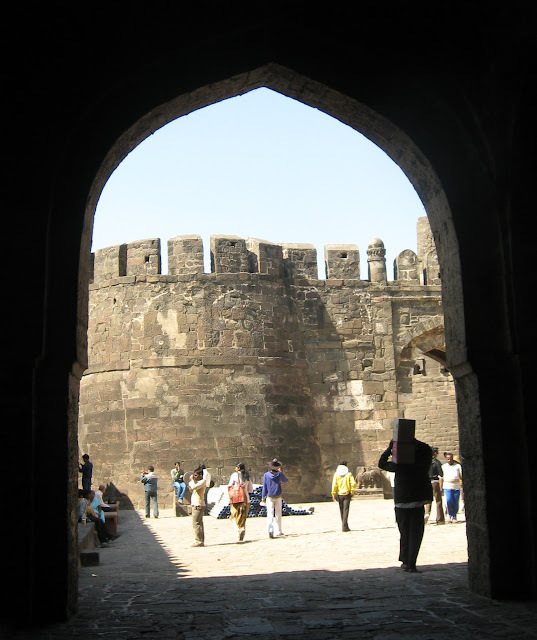 Even before one gets to this, there are a series of encircling walls and bastions, which add to the strength of the fort. 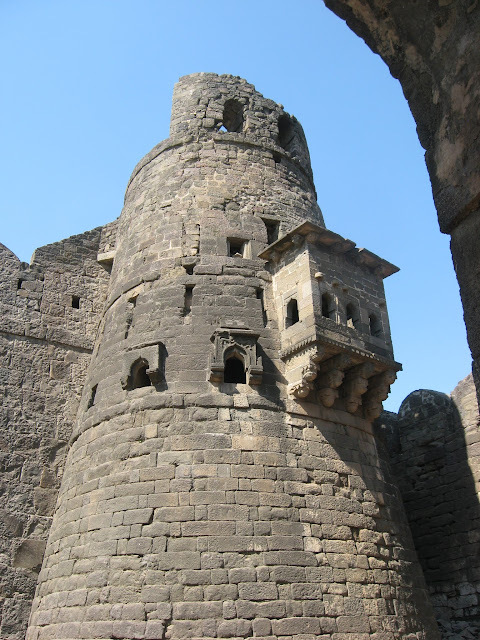 At one time, this must have been one of the strongest forts in the Deccan, and it is no wonder that it was coveted by every great force and ruler to ever rule this area. 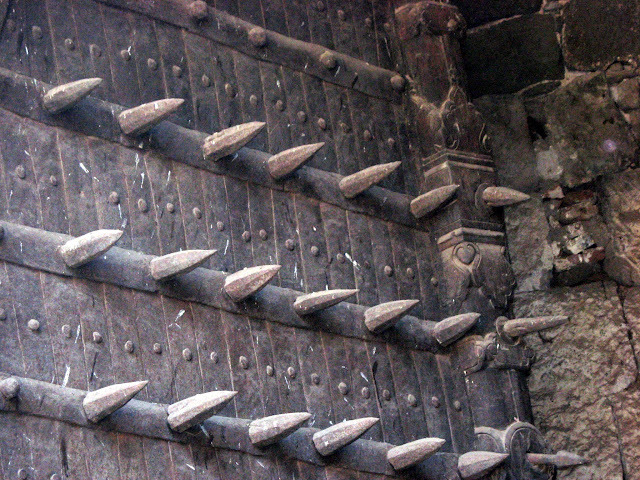 The entry is impressive, standing strong even now, the sharp iron studs reminding us that this was no grand palace, but a fort built for resisting the enemy. 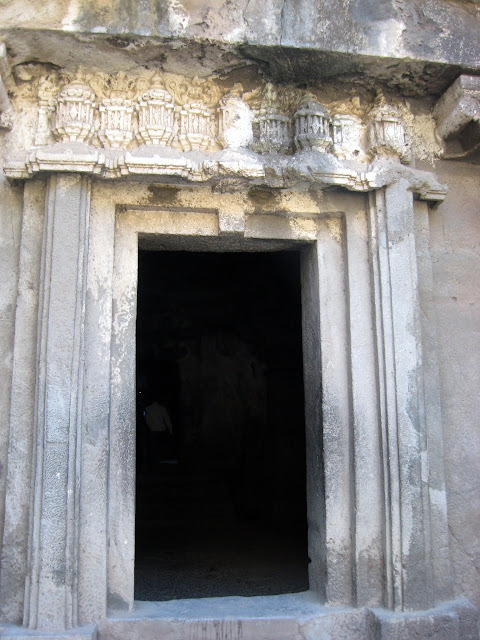 Inside the doorway is another matter, with the stone work on the ceiling belying its martial purposes! 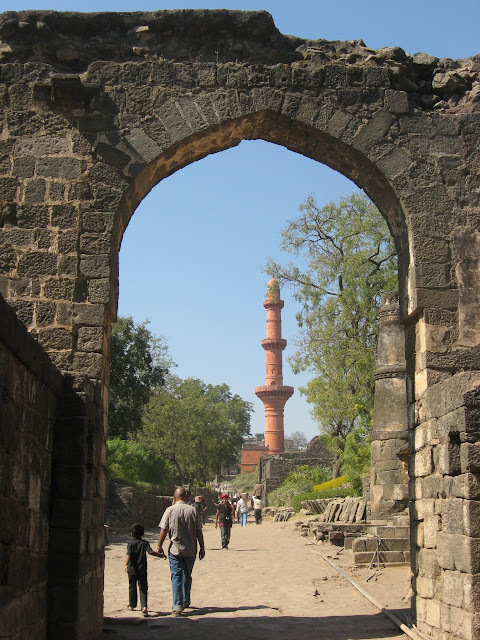 Further ahead is the Chand Minar, which is one of the few intact structures inside. 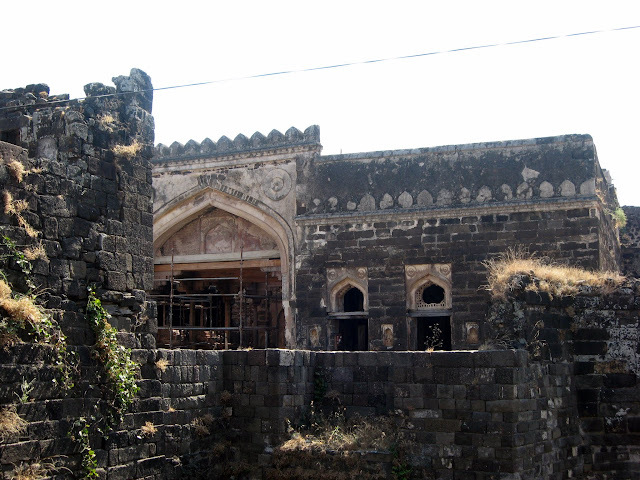 It was built in 1435 by the Bahamani Sultan, Ahmedshah II, commemorating his victory over Gujarat. 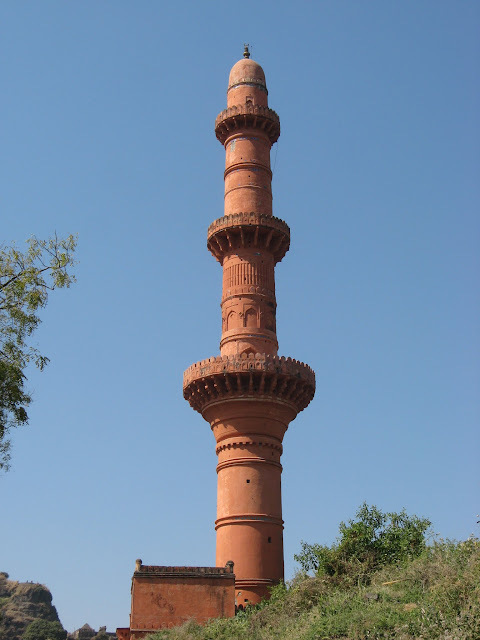 The Chand Minar was built to be a watch tower, as well as a tower used for the call to prayer. 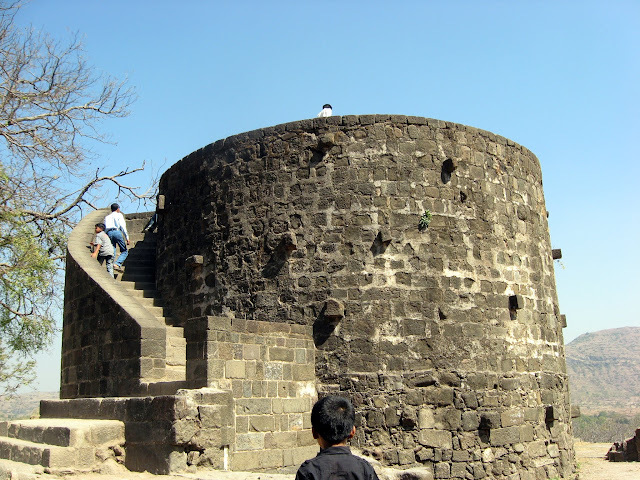 The tower has 4 floors, with a helical staircase, and one can climb all the way up and have a wonderful view of the whole fort from the top. We, however, had neither the time, nor the energy.... maybe another time! 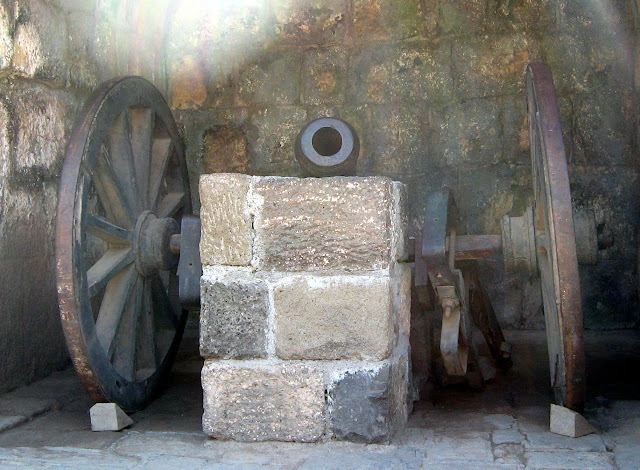 The third line of defense – the Kalakot – leads us to the heart of the fort. This section lies right on the conical hill, and the natural advantage has been used to its best purpose, with a moat surrounding this section, and a steep wall that is impossible to scale. The moat is today a stinking mess of algae covered water, but in its heyday, it was connected to the river by a narrow channel, which kept the water clean and fresh. 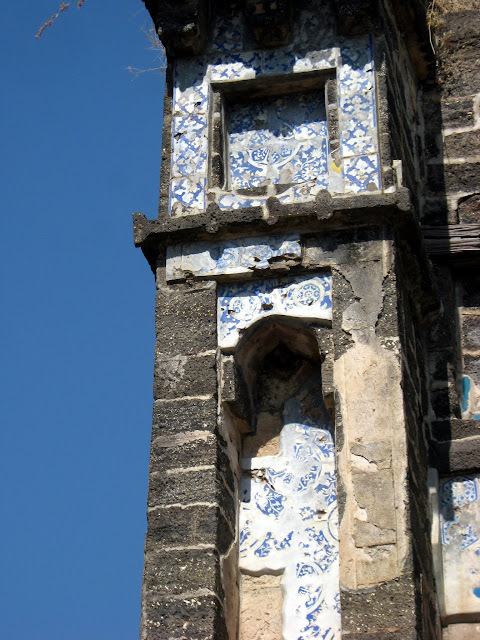 Within this section is the Chini Mahal – the name comes from the yellow and blue enamelled tiles that covered this two storeyed building. 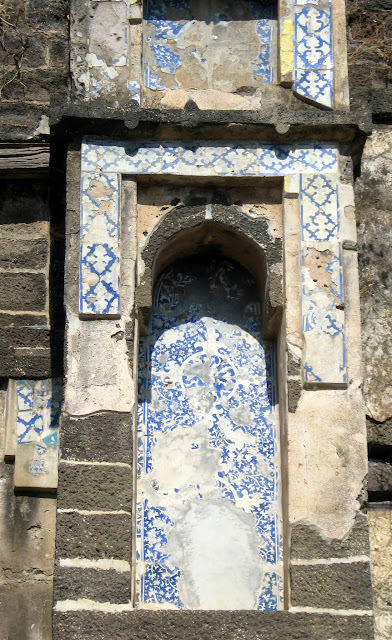 The roof has now fallen in, and little remains of the tiles, but at one time, this building played an important role in the history of the area. 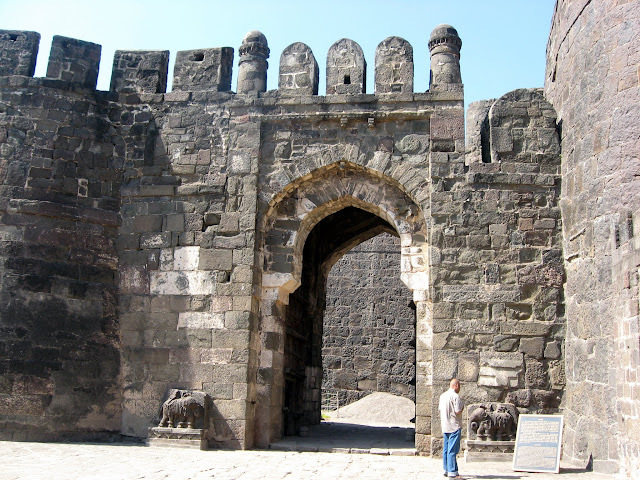 it was here that Aurangzeb imprisoned Tanashah, the ruler of Golconda, till his death in 1700. 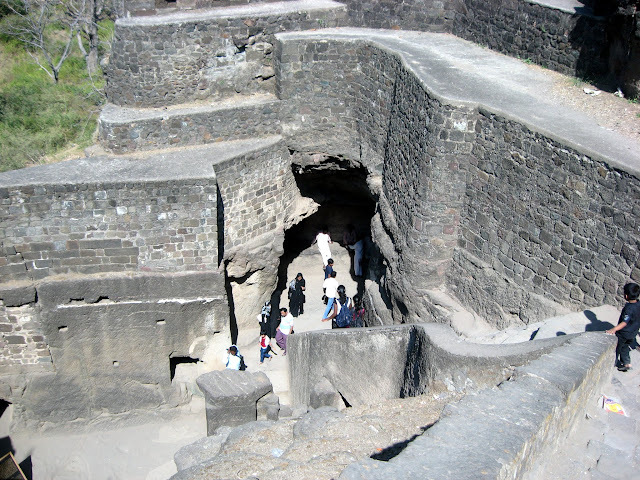 At one time, this section was filled with zigzag passages which led to the innermost recesses of the fort, built to confuse the enemy if he ever got so far. 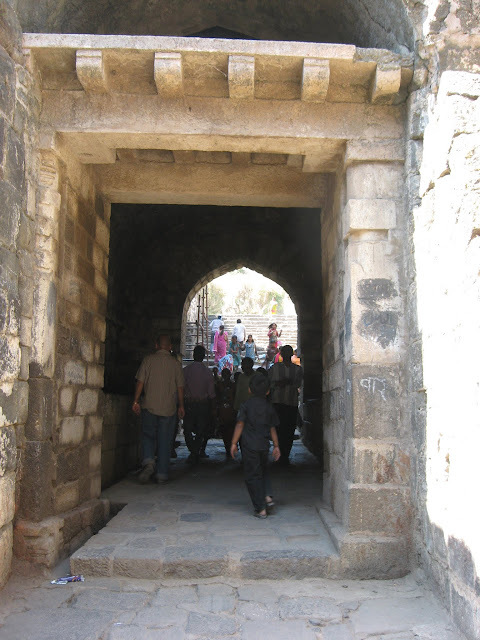 Today, most of these passages lie in ruins, but walking in this section remains as confusing as ever! 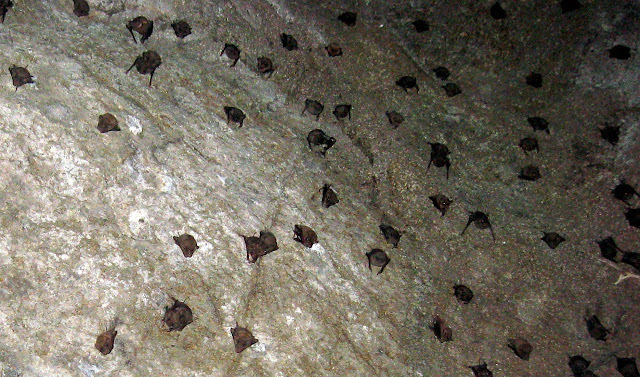 It is here that the Andheri is located, the dark passage filled with bats! 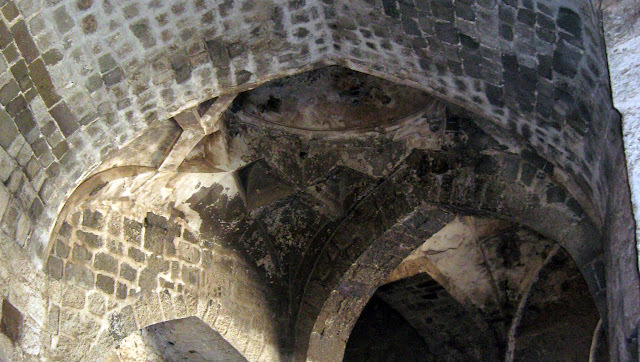 The passage was cut out of the rock, as a tunnel, with guard rooms around it. It is said that the enemy was lured into this passage, and then hot oil was poured into it, scalding them. There are also inlets provided which blew smoke into this tunnel to choke them, and besides all this, there are also trapdoors which could be opened and closed from the outside, sending the hapless enemy straight into the moat, which was once filled with crocodiles! 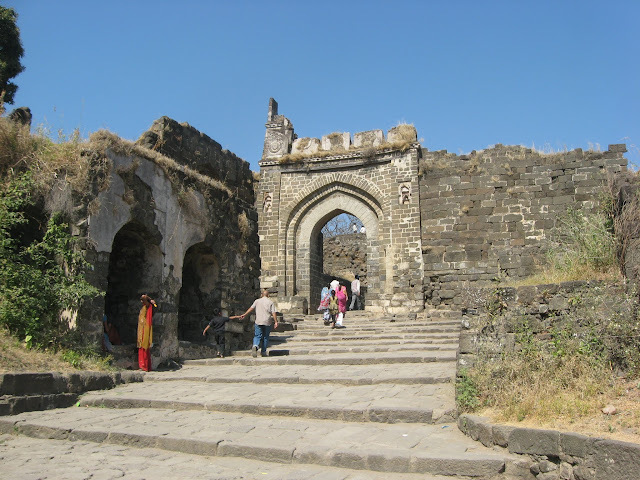 If you are visiting Daulatabad, make sure of two things – first, avoid the summer... walking around the fort is tiring enough without the sun beating down on you! 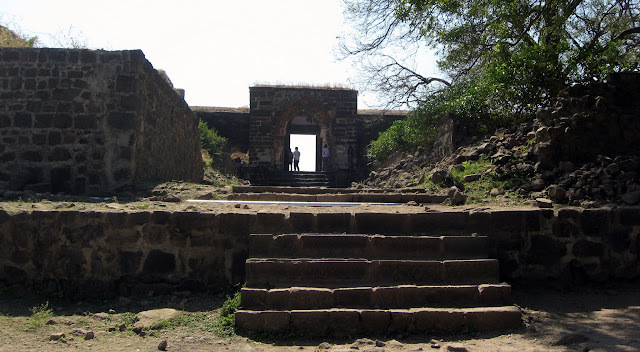 And second, do not underestimate this fort and allot it just an hour or two. You can spend almost an entire day here! 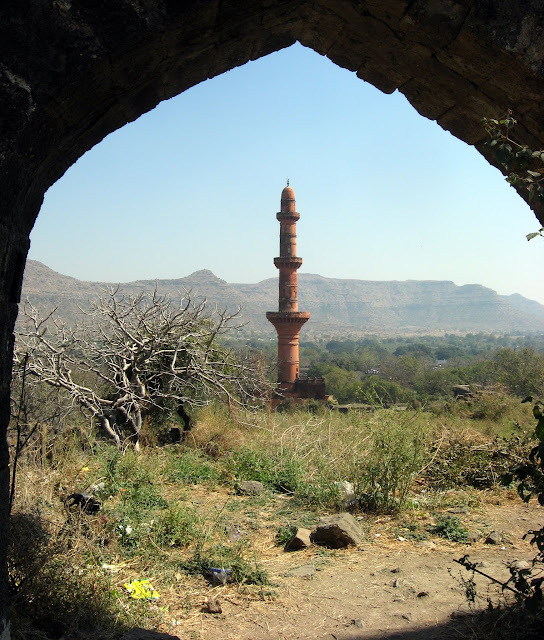 Location; Daulatabad is about 16 Km from Aurangabad. 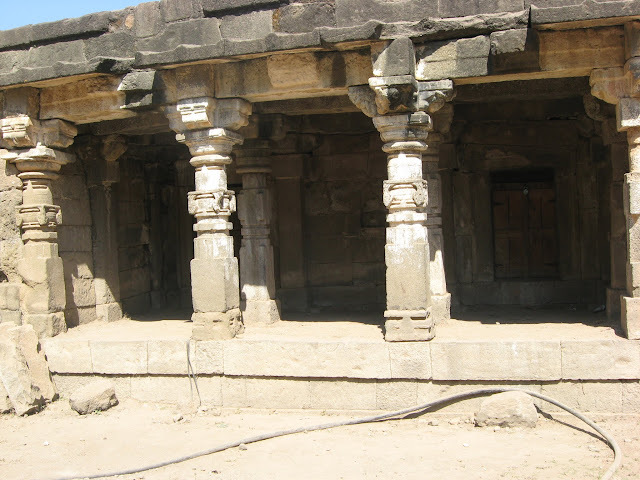 By Train: The nearest railway station is at Jalgaon, which is connected to other parts of Maharashtra by train. 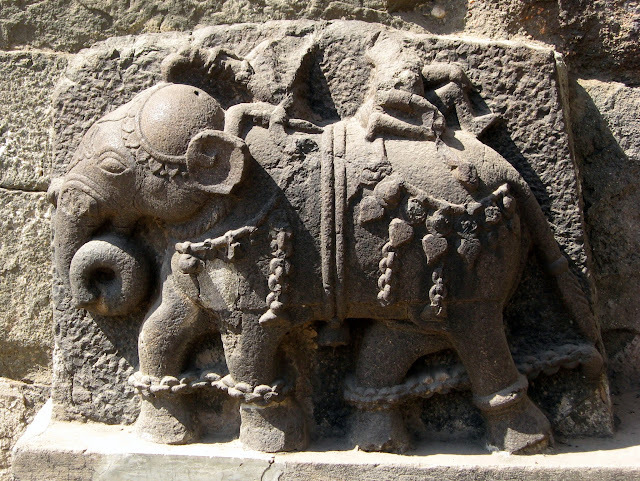 However, Bhusaval, about 30 Kim from Jalgaon is well connected to all parts of India. 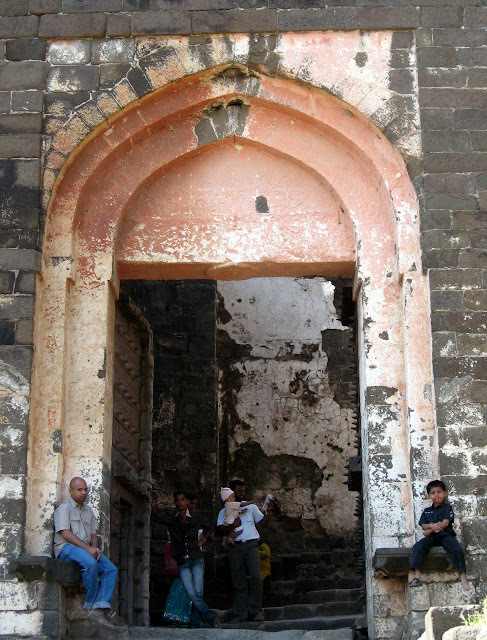 There are also plenty of trains to Aurangabad from Mumbai and other cities. 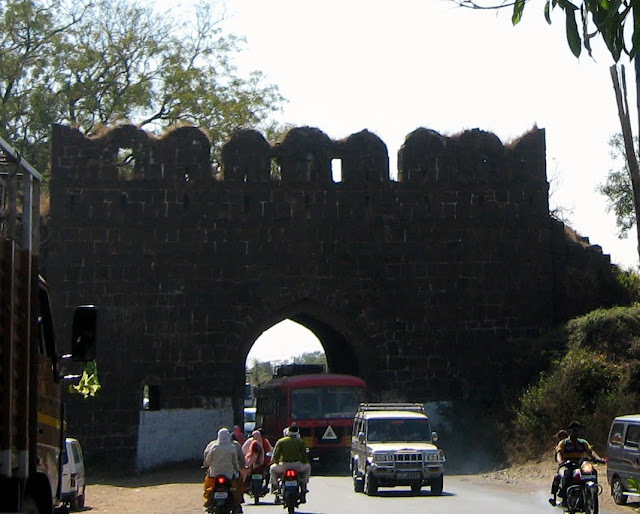 By Road: Aurangabad is well connected by buses from Mumbai as well other cities in Maharashtra. Bus Tickets for Aurangabad by MSRTC buses can also be booked online. 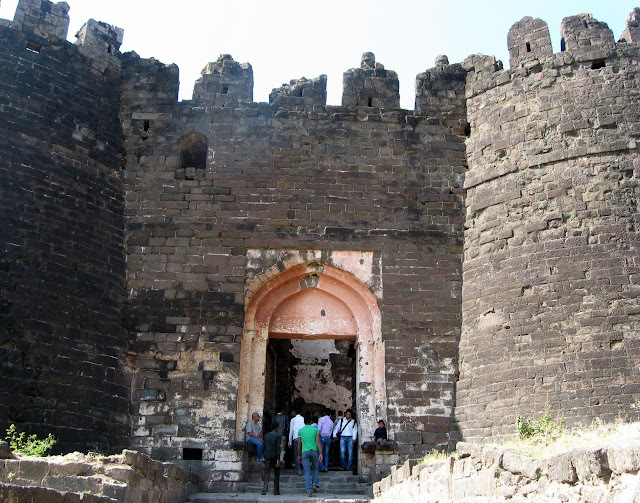 Where to Stay: There are a few hotels at Daulatabad, but it is a better option to stay at Aurangabad, which has plenty of hotels to suit all budgets. 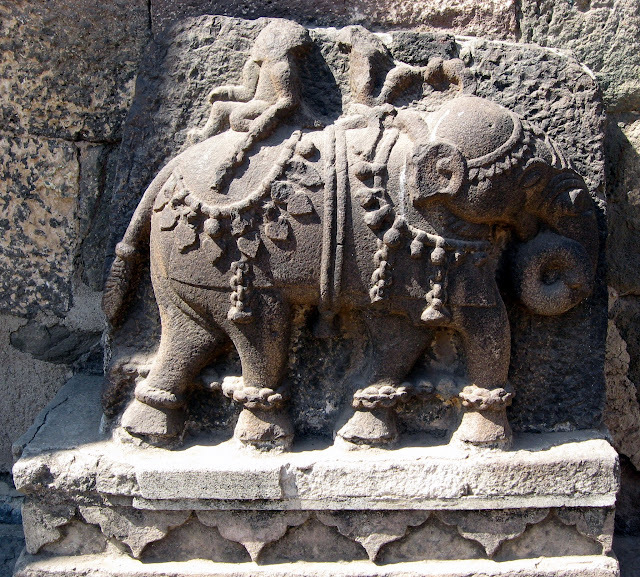 Suggestions: Aurangabad is the ideal hub for visiting Ajanta, Ellora, Grishneshwar temple, as well as Daulatabad. 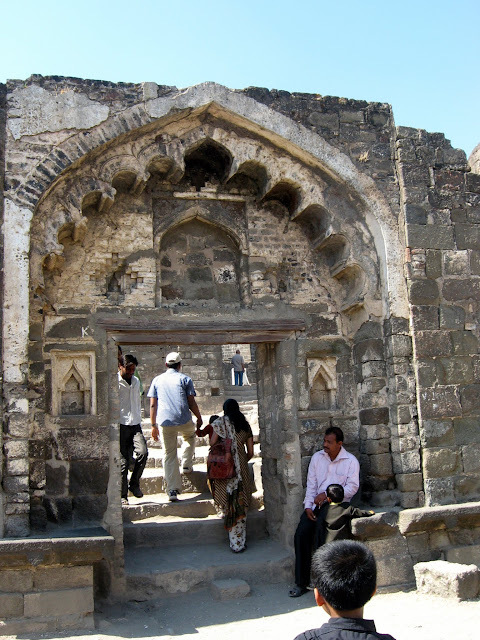 You can also visit Aurangzeb’s tomb and the Bibi ka Maqbara, as well as some more interesting monuments nearby. However, make sure to keep aside at least a few hours for the fort... it’s worth it! 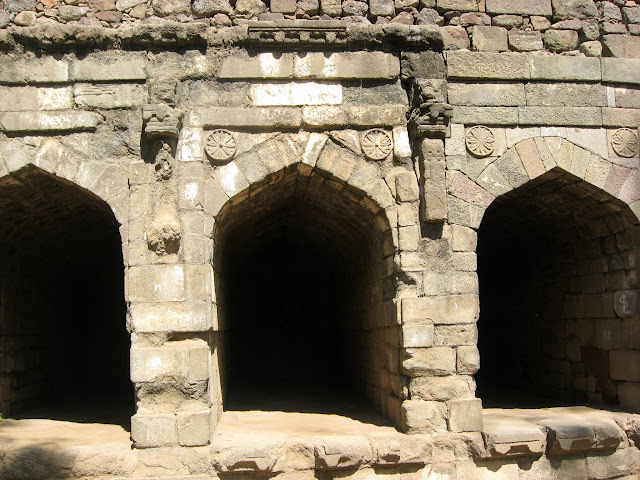 The fort reminds of Golkonda fort in Hyderabad. It looks interesting and your pictures bring out the history and enigma behind it. Nice. 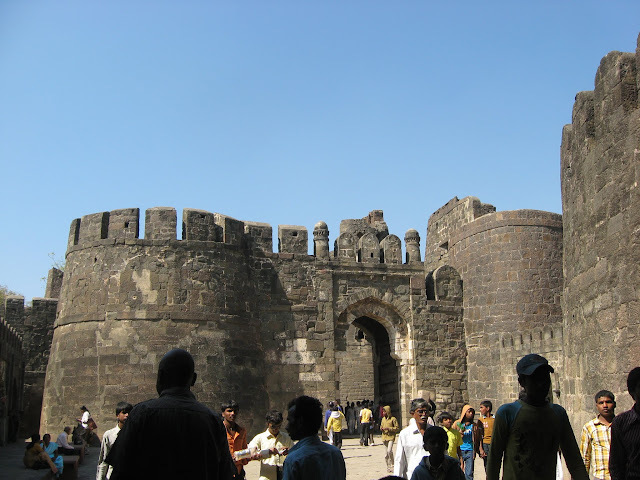 Wonderful fort. Nice post Anu! Would love to visit the place. This is a great fort! Your post brought back the memories of my travel to this place few years ago! !